Good BBQ In Upstate NY? With 58 Main BBQ In Brockport, NY It Is Possible! Who says you can only get good BBQ in the south? 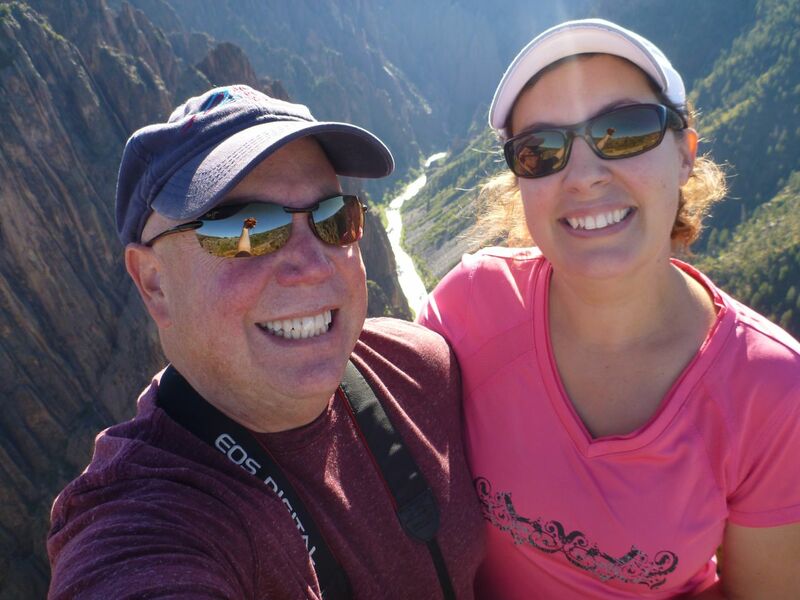 We have traveled all over the south and yes, we have had some great BBQ. However, we are lucky enough to have a great BBQ place right down the street from where we call home in the summertime. 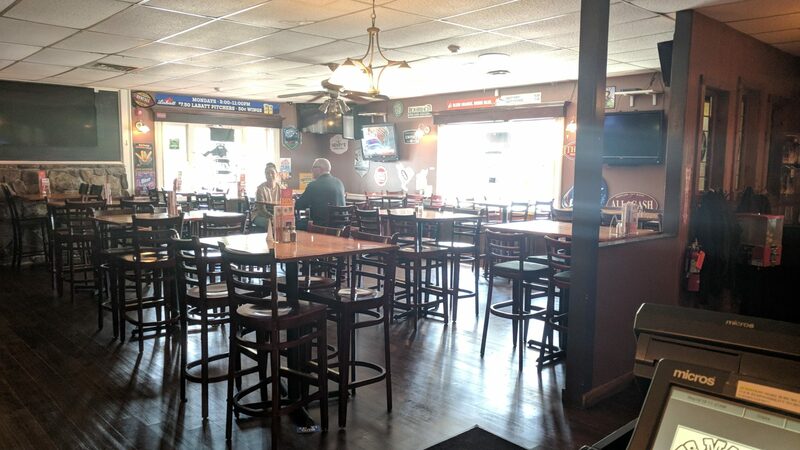 Just a short drive from Southwoods RV Resort, where we have our seasonal site, is a full restaurant and bar called 58 Main BBQ. 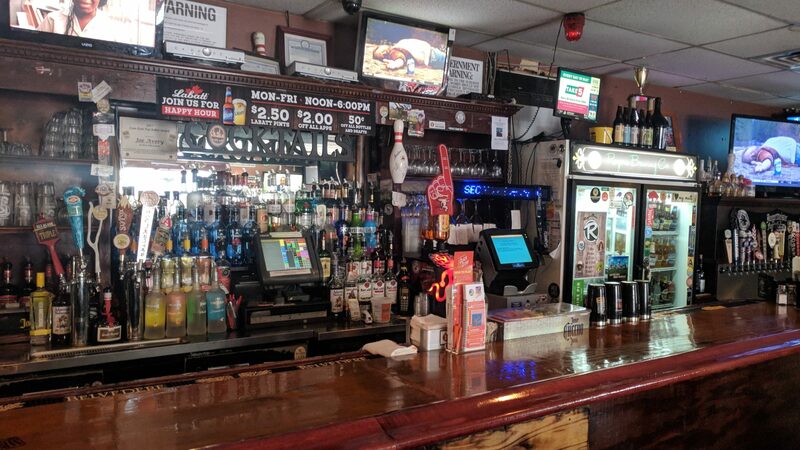 Two brothers (twins) own this BBQ joint when they bought out the restaurant that they had worked at since they were 14 yrs old and in 2003, the restaurant was officially renamed 58 Main BBQ. With a full bar, lots of seating in the restaurant, party room and outside catering, they certainly keep themselves busy. We went when it was brunch time really. So the restaurant looks empty but trust me, this place fills up fast for lunch as well as dinner. This seating is only a third of what they can handle inside. They also have an outdoor patio to enjoy the nice weather. David, being his first time eating there, wanted to sample a bunch of different items. So he ordered the the “Oink and Moo”. This consisted of a quarter rack of ribs, quarter pound of pulled pork and a quarter pound of smoked brisket…plus two sides! 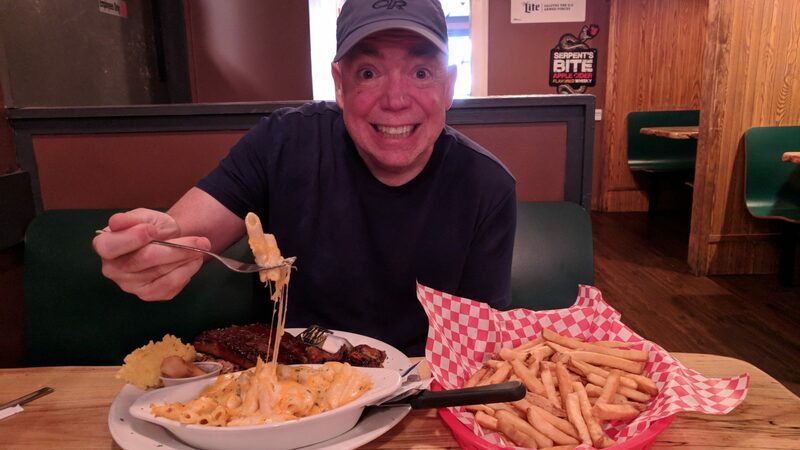 There are many choices for sides but David went with the Mac and Cheese and French Fries. Umm…..there is so much food there that the fries actually come on a separate basket! Oh, and did I mention that you also get a small cup of baked cinnamon apples and a square of corn bread. You know, just in case that wasn’t enough food for you :) Needless to say, David had lots of left overs for a few meals afterwards. 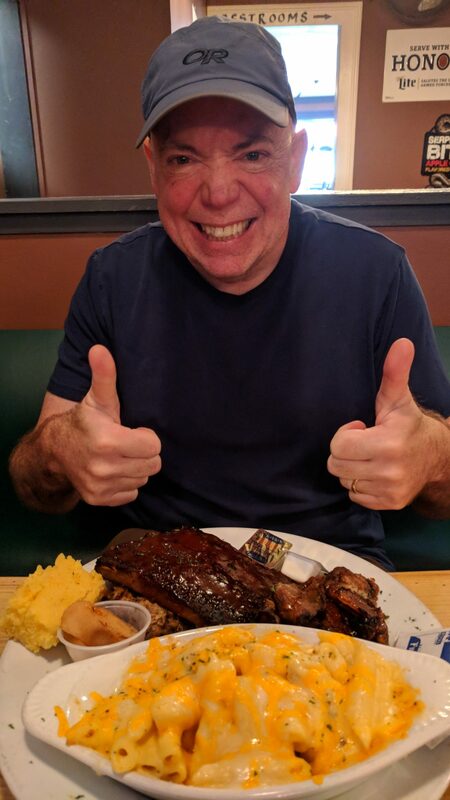 I on the other hand had eaten there a couple times before with my friend Trish (who introduced me to 58 Main BBQ in the first place, Thanks Trish!). I ordered the pulled pork quesadilla, one of my favorites, but honestly, it’s hard to choose wrong here. Doesn’t sound like much but oh my! 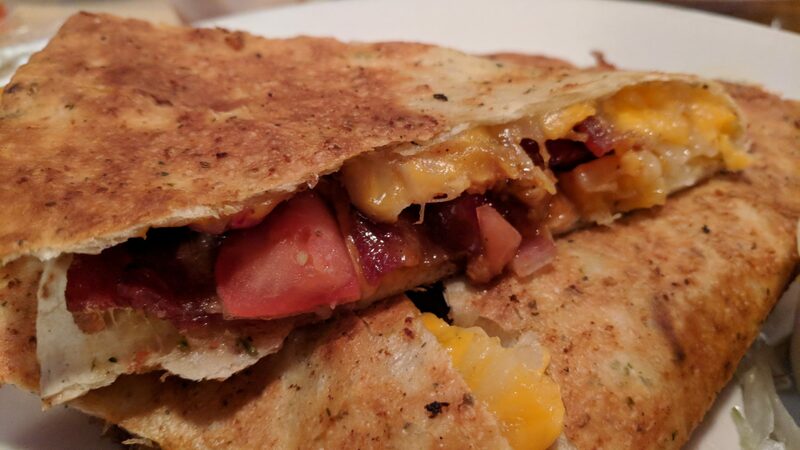 It is pretty big and stuffed with pulled pork, bacon, tomato, onion, jack and cheddar cheese. All with a side of sour cream and salsa. This thing is so big that I can only finish half of it. So leftovers are the name of the game here. I defy anyone to finish a whole meal here. 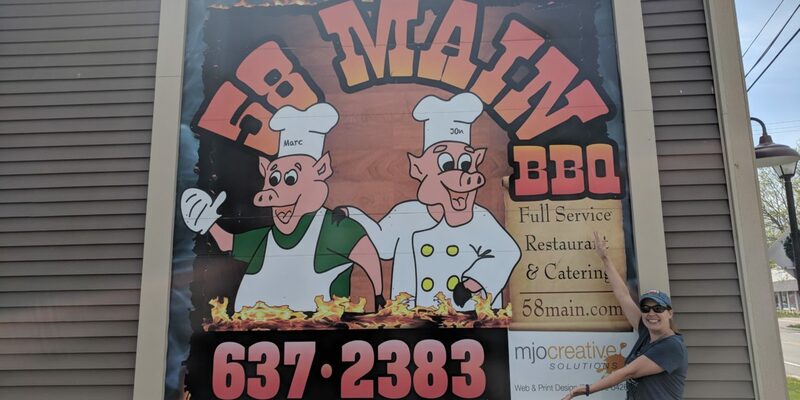 So next time you find yourself in our neck of the woods and you are craving some good BBQ, make sure you check out 58 Main BBQ. You’ll know you found the right spot when you step out of your car and the smoke house hits you and your mouth starts to water. And might I suggest after your meal, you work off some it by walking the path along the Erie Canal, which is only a block up from their front door. PreviousLooking For Some Love On-Line – OK, Likes! NextBott-Lott CampJams Planned For 2018…Mark Your Calendars!